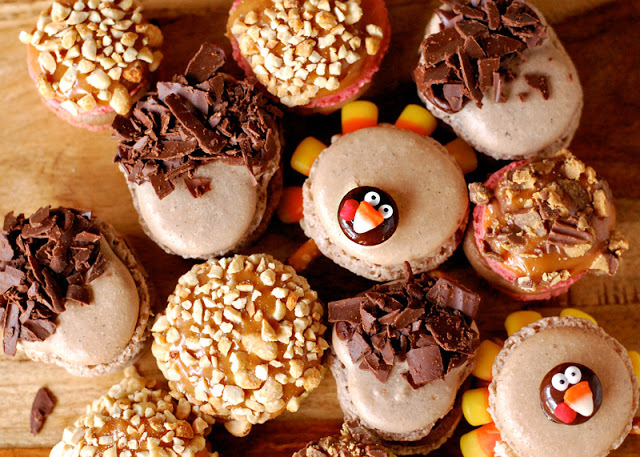 Turkey with Candy Corn, Hersey bits and pretzels. And the icing that we piped in between is absolutely divine!!! I'm drooling just writing that out - sigh..
We started out the same way we did before when we made the Halloween Macarons; measuring the powdered sugar (200 grams) and almond flour (100 grams) for each batch. 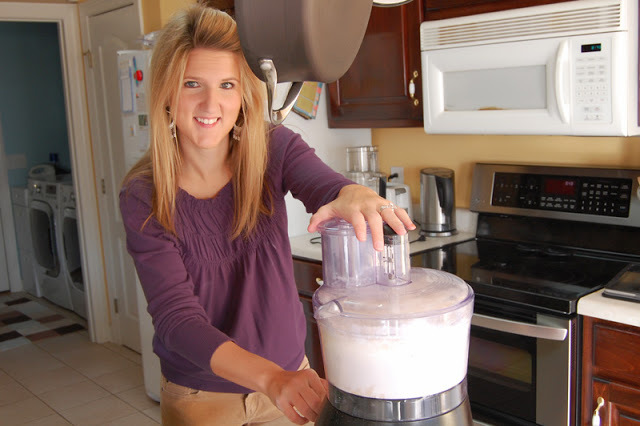 Split and scrape the vanilla bean. And added the powdered sugar, almond flour and vanilla bean seeds into the food processor. We used two types of chocolate: Hersey's Cocoa and Ghirardelli Unsweetened Cocoa to get slightly different colors for the turkey and acorn. For the green and red apples we used Leaf Green Pearl and Ruby Red Color Dust. 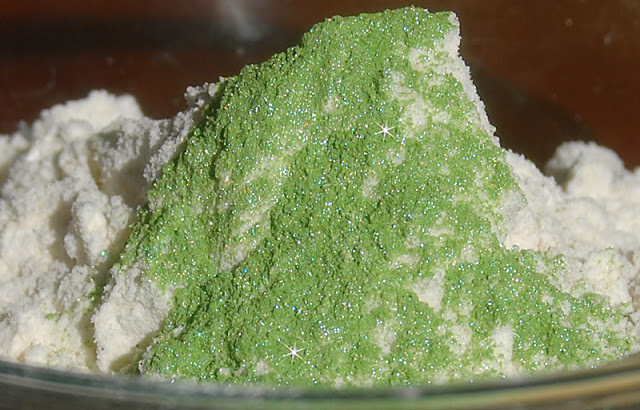 The Green Leaf Pearl Dust is pretty and sparkly! Whip the egg whites until light and frothy. Then added 25 grams of sugar to the egg whites and beat until stiff. Then fold the stiff egg whites with the dry ingredients, no more than 50 times. You'll know it is done when the dry ingredients are no longer dry and when you run a spoon down the middle it folds back together. 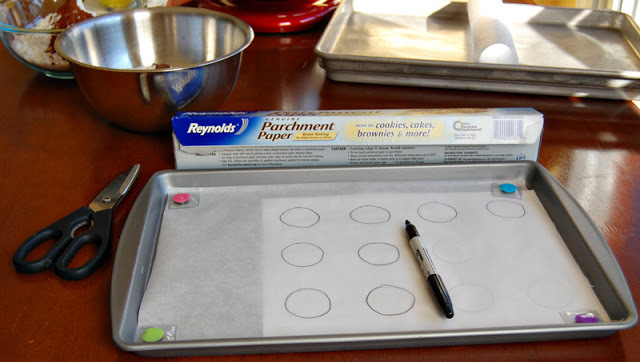 To prepare the cookie sheets we drew circles on parchment paper. 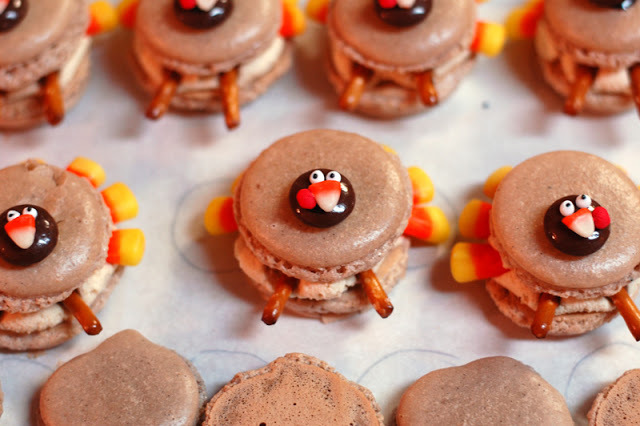 Be sure to lay the parchment paper where the side that wants to curl up (notice we use magnets to hold it down), then flip it over (if you don't you'll end up with black circles on your Macarons). 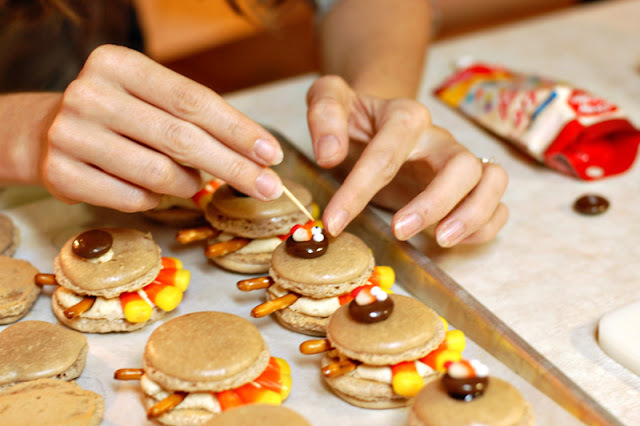 We also drew acorn outlines as well to ensure we didn't make the Macarons too big or too small. Here's a helpful template collected from http://marvwoodhouse.com to make circles. We put the batter into Wilson Disposable Piping bags. 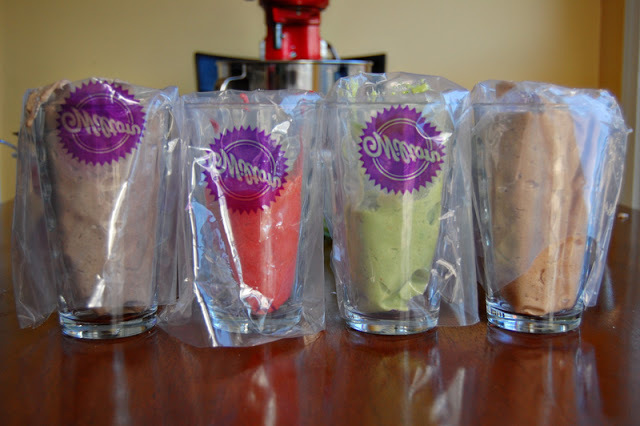 We placed the bags with the #12 Round tip and piped the batter onto the parchment paper. 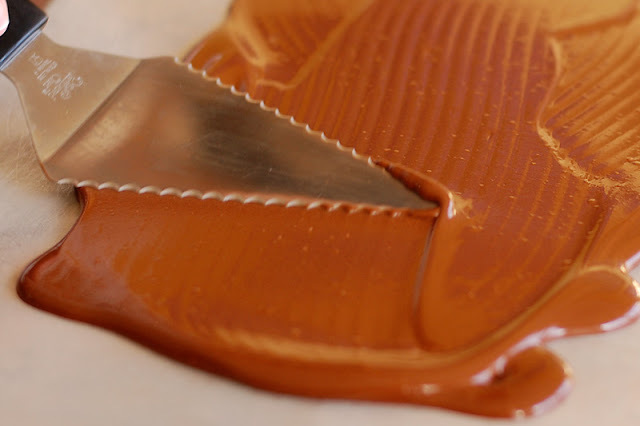 Once the batter is piped on, take a break (at least 45 minutes) to let the batter rest. We went out to lunch at Shea's Express and I bought a new camera lens (Merry Christmas to me :) ), you'll notice a difference in the pictures after this point. Once we baked the red and green apple we realized our lesson, and we made them again. On the bright side, with every mistake a break-through is made! 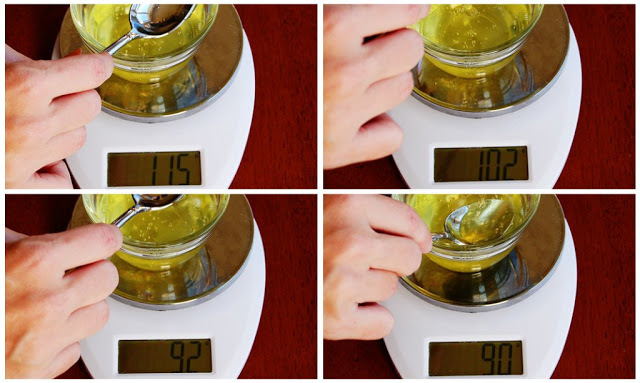 The shortcut: To quickly age egg whites, place the egg whites in a glass container, then microwave for 15 seconds, check every 5 seconds until the egg whites are room temperature. They turned out perfect!!! Now the fun begins - decorating!!! Melt the Kraft Premium Unwrapped Caramel Bits according to the bag; keep warm. The Apple Butter Frosting is AMAZING, recipe below. 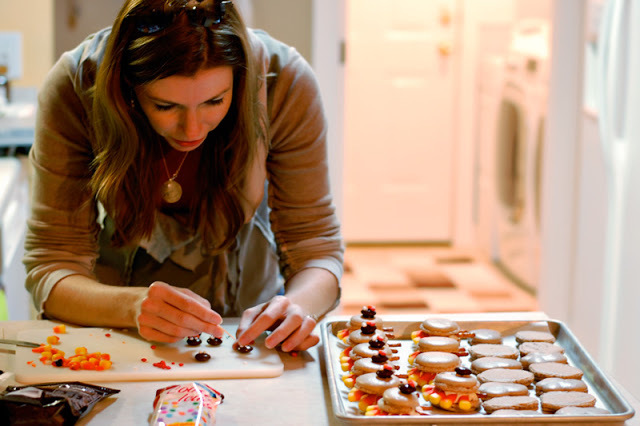 Amanda and I make a great team, she lets me do the super detail decorating stuff and I'm totally supportive and completely understand when she wants to make sure the Macarons are perfect - together we make beautiful food that tastes heavenly. We added 5 or 7 Candy Corns, two pretzel parts, a Hersey bite held on with a dot of icing, cut a Candy Corn for the nose, an Apple shaped sprinkle for the waddle and two dots of icing with one black sprinkle. And Peanut Butter Frosting inside. 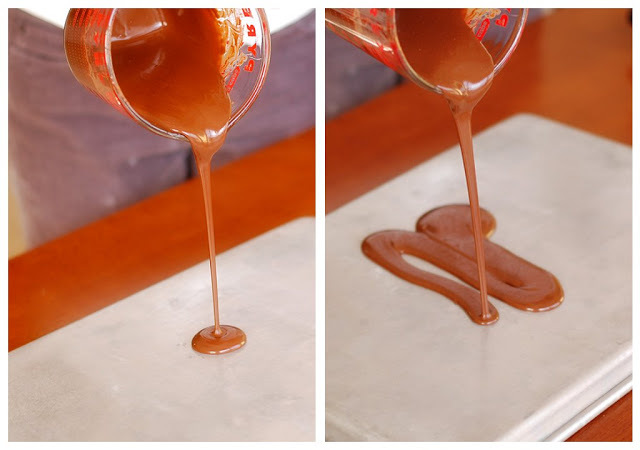 Pour the chocolate onto the back of a cookie sheet and follow the instructions below for making the curls (when the curls don't curl, put it back in the fridge for a few minutes until it is chilled again). Aren't the chocolate curl gorgeous! 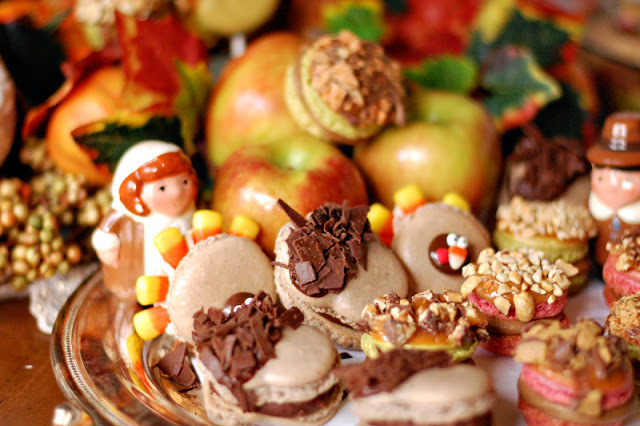 We headed over to my house where I had setup a cornucopia and silver platters for Thanksgiving decorations. While packing up the Macarons we paused for the beautiful site, wouldn't you just LOVE to have this for a Christmas present! 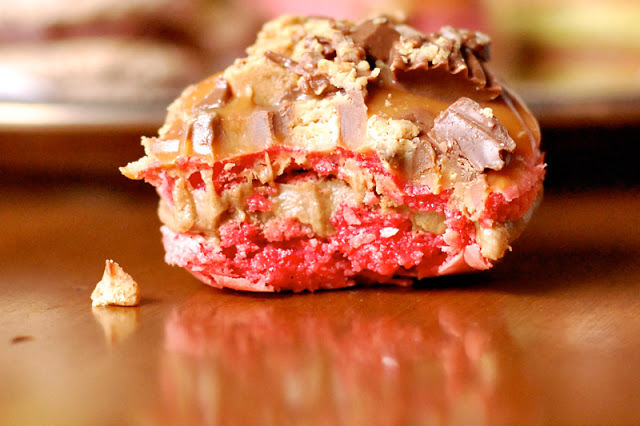 The first bite of the Caramel Apple Macaron topped with Caramel and Reeses Peanut Butter Cups, filled with the Apple Butter Frosting - YUM! 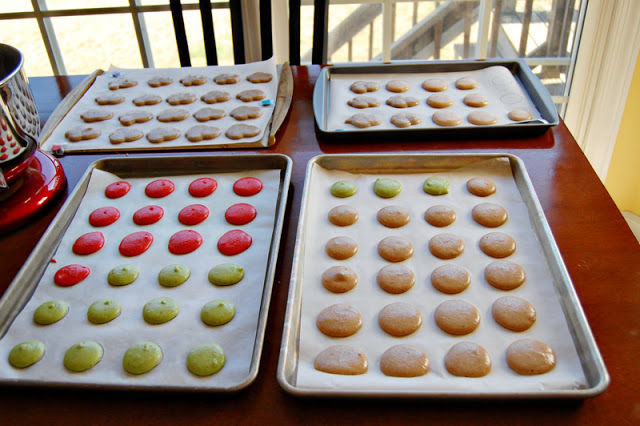 Be sure to check out Amanda’s photos and recap of our macaron making day. In a saucepan, melt the butter. Add the apple butter and brown sugar. Bring to a boil and lower the heat to medium low. Continue to boil for 2 minutes, stirring constantly. Add the milk and the cinnamon and bring to a boil, still stirring constantly. 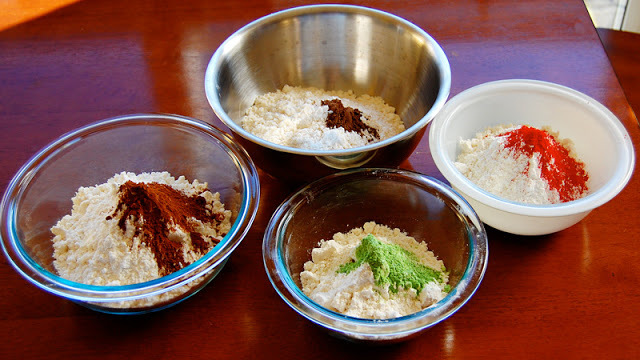 Gradually add the powdered sugar and beat until thick enough to spread. 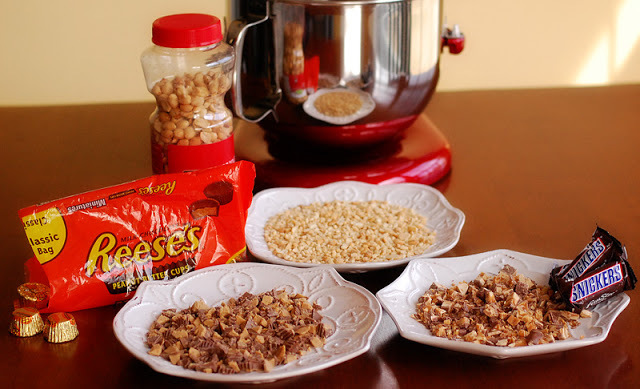 Combine chocolate and shortening in a microwave safe bowl and heat until melted, stirring every 30 seconds. Turn a clean sheet pan upside down and pour melted chocolate over the bottom of the pan, spreading thin with a spatula. Freeze for 5 minutes until chocolate is hardened. 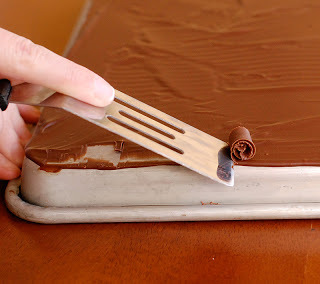 Use a small spatula to scrape chocolate off the pan forming curls. If chocolate is too hard to curl, let rest for 1 minute. Place the butter, sugar, milk and vanilla in a large mixing bowl. Beat on medium speed until smooth and creamy, about 3-5 minutes. 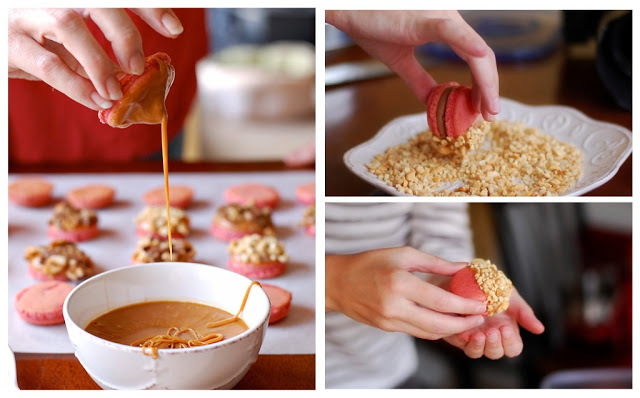 The Macaron Recipe is at the bottom of the Halloween Macaron Post.